Cassaday & Co. Inc. encourages employees to think like business owners. Salaries are relatively small. The rest of employees’ pay is based on the firm’s top-line revenue, whose growth is fueled by an intense focus on customer service. “Our structure is different. 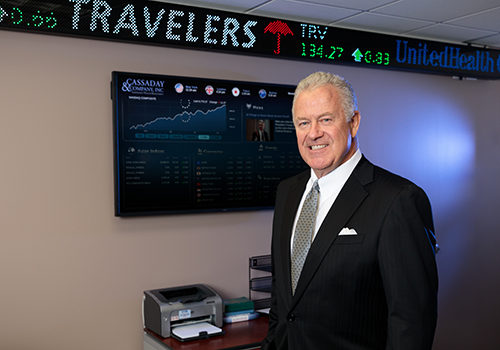 Our employees know who butters their bread and why,” says Stephan Cassaday, founder, chairman and CEO of the Tysons-based wealth management firm. This type of pay structure motivates and “empowers employees to consistently do their best at work,” he adds. Commissions on all types of trading on stocks, bonds, mutual funds, etc., represent 4 percent of the firm’s revenue. The remainder comes from fee-based asset management. After working for other brokerage firms for several years, Cassaday abandoned the traditional Wall Street model in starting an independent firm in 1993 to serve investors seeking impartial advice. Since then, total assets under management or supervision grew from $40 million to $3 billion as of December. The firm has nearly 50 employees serving more than 2,000 households in the U.S. Most of its clients live in Virginia, Washington, D.C., and Maryland. Barron’s ranked Cassaday as No. 1 in Virginia on its list of America’s Top 1,200 Advisors. It was his fourth time as the top Virginia adviser on the list. Cassaday & Co. also has been recognized as one of the Best Places to Work in Virginia for the past eight years. Cassaday says he follows simple principles in guiding his workforce, empowering employees to do their jobs in a way that complements their talents. The company encourages communication with employees through an open-door policy. “We work to make sure people are comfortable in coming to us. We always have open channels,” Cassaday says. The firm pays for training for professional designations, such as certified financial planner, or securities licensure. “We are supportive of our employees getting extra education such as graduate school or certified public accountant education,” Felix says. Employees receive an extensive list of benefits, including health, dental and vision insurance as well as flexible work schedules, paid parking, early release days, birthday paid time off and gym memberships. The firm’s dependent-care assistance includes daycare and after-school programs. “That has been appreciated especially by people coming from other organizations that don’t have that,” Felix says. In addition, employees take part in a variety of social outings, ranging from visiting wineries and playing paintball to attending concerts and spending a day at a spa. “We try to keep it fun and different. Every year we do something new,” Felix says.